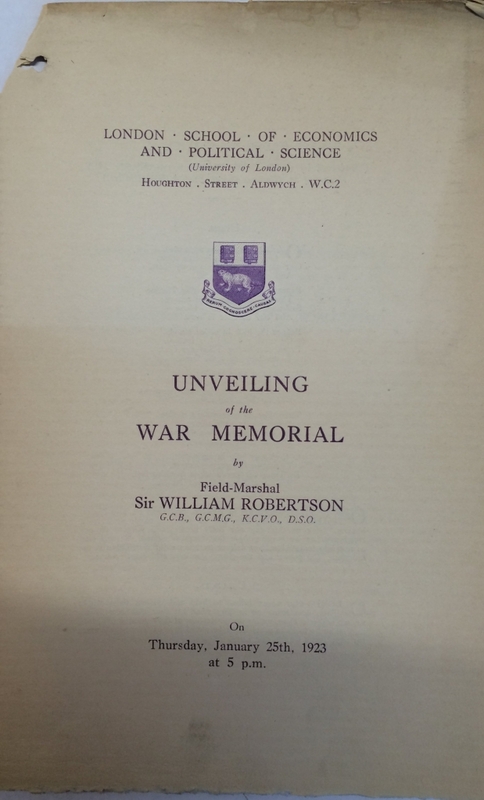 The move to commission, design and erect a First World War memorial was begun by the Students’ Union in 1921, writes LSE Archivist Sue Donnelly. It was unveiled in a ceremony in 1923. The Students’ Union is anxious to commemorate those students of the School who fell in the Great War, and propose in the first place to erect a memorial table bearing their names, and in the second place, if funds permit, to establish a prize or scholarship in connection with the School. 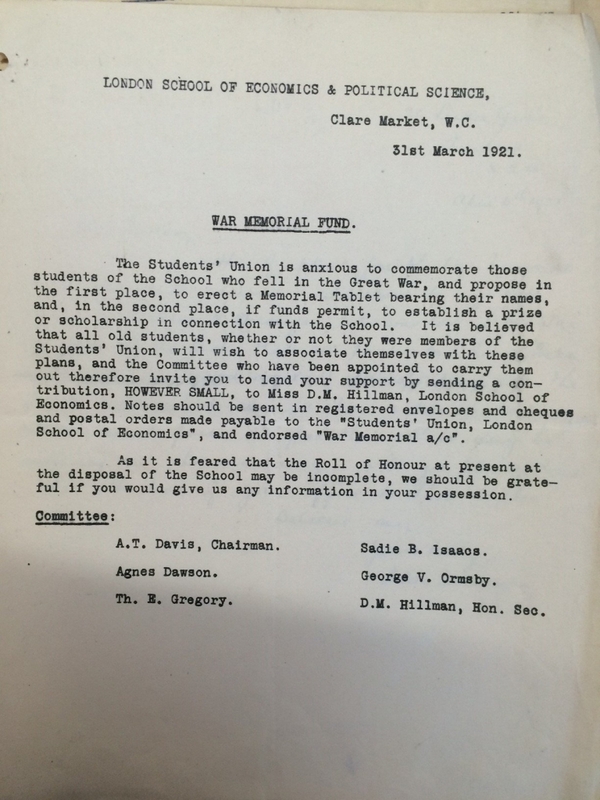 So began a circular letter sent in March 1921 by the Students’ Union to 1,250 former students seeking donations for the erection of a war memorial. The same appeal was made to students and notices were placed in the student magazine, Clare Market Review. The project was organised by the War Memorial Fund Committee chaired by the President of the Students’ Union, Alun Davis, and with the economist Theodore Gregory as staff representative. The committee informed the School Secretary, Jessy Mair, about their project and the Governors were asked to sanction the erection of the memorial in the entrance hall of the Old Building. On 16 November 1921 the Students’ Union General Meeting approved a scheme to erect a bronze tablet bearing the names of the fallen. The appeal had raised £133, 11 shillings and 3 ½ pence. Selecting a design proved trickier. The Students’ Union preferred a design by Messrs F Osbourne & Co of a bronze tablet with the LSE coat of arms in coloured enamel. Unfortunately the Governors selected a design by Charles Frederick Norman of the School’s architects Norman and Trehearne. In March 1922 the Director, William Beveridge, took matters into his own hands and wrote to the sculptor F J Wilcoxson, asking him to produce a design for a bronze plaque which would fit in with the surroundings at LSE. Frederick John Wilcoxson (1888-1978) had studied at the School of Architecture and Applied Art at Liverpool University and then enrolled at the Royal Academy of Arts, London. After war service with the Royal Army Medical Corps and Royal Field Artillery he taught sculpture at the Royal College of Art. Wilcoxson presented four options and the School accepted his third design at an estimated cost of £150. Messrs F Osbourne & Co received compensation of ten guineas for work already undertaken. The decision to include the School’s coat of arms on the memorial meant that the School decided it was time to register the design with the College of Arms. The war memorial was unveiled on 23 January 1923 by Field Marshal Sir William Robertson, formerly Chief of Imperial General Staff. In his speech Robertson thanked the School as ‘the army was much indebted to the London School of Economics and was sure those officers who worked at the School before 1914 found that the knowledge that they had acquired was of great help in the war’. Wreaths were laid on behalf of students past and present, staff and governors. The Coldstream Guards provided a bugler. The Chairman of the War Memorial Fund Committee asked that Christian elements of the service be removed so that the event could be universal. Some changes were made though the service was led by Reverend William Pennington Bickford, Rector of St Clement Danes. The war memorial was initially located on the first floor of the Old Building but in 1932 it was moved to the main entrance. In 1953 a new memorial was unveiled marking the dead of both the First and Second World Wars and the first memorial was lost.